After being shut out Friday night, BU got on the board Saturday night against Lowell, but Evan Rodrigues' third-period shorthanded goal was the Terriers' only score in a 3-1 loss to the Riverhawks. The loss dropped BU to 6th place in Hockey East. The # 4 Terriers’ sweep of Connecticut this weekend, combined with BC’s Friday night tie with Vermont, earned BU the regular-season Hockey East title, the second in the seven years of the women’s program. Saturday, on senior night, BU spotted the Huskies a 5-1 in the first 23 minutes before roaring back for six unanswered goals and 7-5 win. Senior Jenelle Kohanchuk and freshman Sarah Lefort (photo) each tallied twice for the Terriers, with sophomore Kayla Tutino scoring the game-winner early in the third period. On Sunday, BU took a 2-1 first period lead, which it extended to 4-1 before UConn scored with seconds left in the game for a 4-2 win that clinched the conference title. Lefort scored twice again for a team-leading 19, while Kohanchuk tallied her 18th along with a pair of assists. The win gave was BU’s 18th in league play, the most regular-season conference wins since UNH won 20 games in 07-08. BU will host Connecticut in a Hockey East quarterfinal game on March 2 at 3 p.m.
2013 recruit Brendan Collier assisted on a pair of third-period goals as the Valley Junior Warriors rallied past Springfield in overtime, 3-2. 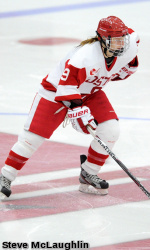 2014 recruit JJ Piccinich recorded his 10th assist in Youngstown’s 3-2 shootout win against Muskegon. Eric Gryba pick up his second assist in five games since his call-up to Ottawa in the Senators’ 3-2 win against Toronto. Kieran Millan stopped 35 shots to lead the Denver Cutthroats past Quad City, 5-2, earning his 13th win of the season.